Once upon a time in a home not too far away from yours lived a family of 5+ and a tiny little kitten named Bella. In this home the kids would use the back French doors to run in and out and in and out as the daylight and beautiful days beckoned them to head outside to play. With all of the in and out there was a lot of tracking, grass, dirt and of course anything else that would stick to the little feet as they would come into the house. One very tired mom almost like Cinderella could often be found sweeping up as her children would come in and out of the house and by the end of the day she was so tired. Then this mother found the ultimate info floor mats and she was no longer Cinderella but the vacuum Quick Queen. This is my tail of lavishly living life out loud and one reason to let the back door open and the tracking in and out begin! That’s right…absolutely nothing was in front of the door because it just seems easier to me to simply run the vacuum over the entire mess. The problem was there was tracking throughout the entire kitchen and debris that went everywhere like grass. I swear I wiped up, or vacuumed every-time the kids or company walked in and out! Now things in this family had to change, the mess just had to stop and FoFlor put an end to the madness and the mess! 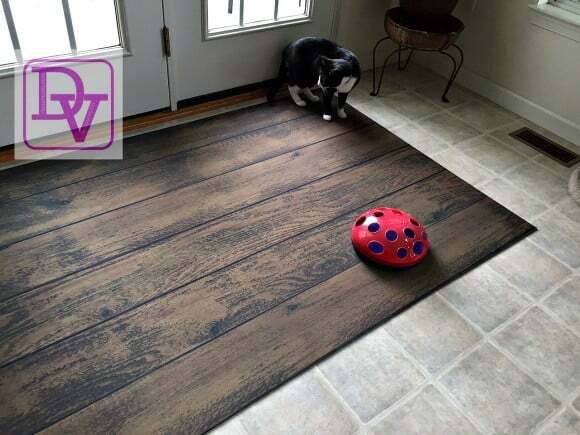 Meet the FoFlor Faux Wood Floor Mat, there are many different patterns/designs you can choose from as well as sizes, but I fell in love with these planks! These FoFlor Mats come in many sizes, colors and designs and are made in the USA and can be found on the Everything Doormats site! Mine is known as an area rug, there are doormats and runners as well. The wash-ability factor on these makes this MOM lavishly live up the outdoor experience with no regrets or remorse for what might be dragged in on shoes and feet! Also please note that as soon as this came, I unrolled it and it went flat without WAITING so order it, it will just work in your life! Once this magical FoFlor Mat was placed down suddenly the tracking debris would stop right at the mat and the mat was easy to clean. The FoFlor mat actually would hold the debris there the grass the dirt whatever it might be so those initial steps into the house were actually on top of a padded mat that does not slip. 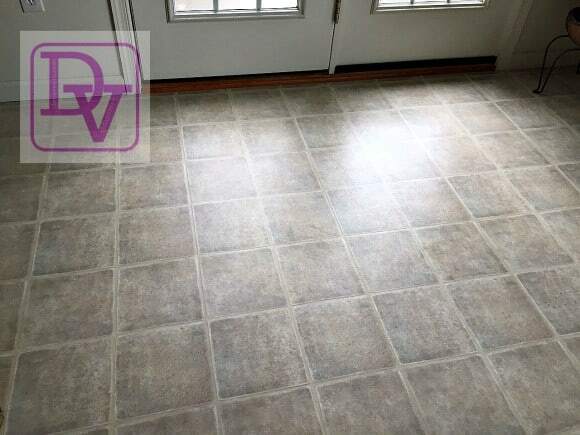 The vacuuming became so much easier it was one swipe and done and there was no tracking across the floor. I love the look of this because it actually looks like wood planks going across my floor almost as though I had wood installed but I did not. Is this very secure or does it slide? That is the thing I like the most, it is so incredibly thin, yet comforting to stand on, and it NEVER slips, in fact this is a very flat, secure mad that holds tight to the floor and is washable, and wipe-able. It is absolutely magical in terms of not having to clean as much as I did before as the debris stays put. Now you might understand why I said: One Reason To Leave The Back Door Open, it is the FoFlor Mat. If you ask me the before and after look are very telltale of how this presents itself in a home adding to the Decor. This is such an easy DIY project that anybody can do it. 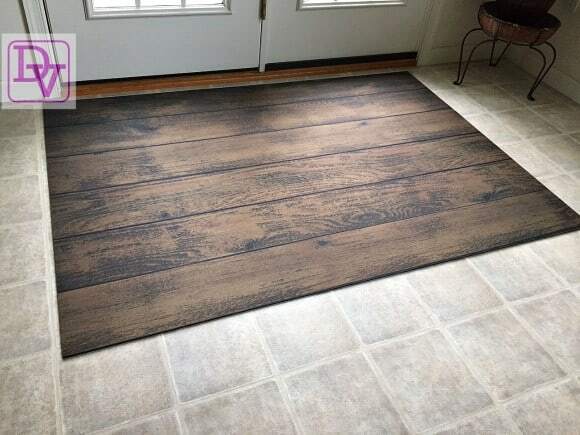 Simply take a room that is lacking a mat, and purchase one of these FoFlor mats down in front of the door and boom it’s all done easy-to-do Decor! I don’t just post things on my site, they really have to be something else to get my attention and to share it with you. I worked with this mat for almost 2 months before I shared it with you and all I have to tell you are GOOD Things. In fact, I held off posting to really put this mat to the test, because my initial thoughts were that the sunlight would bleed this onto my floor, stain or transfer the black backing. That did not happen, in fact, the sun hits this from 9A-1:30P each day and beats on it, and there is NO transfer, no stain, nothing. My next test I wanted to make sure it would clean easily and it did. Now, I steam clean mine(that is not advisable, but I used my steamer on everything) and I have to tell you, still the mat backing and color of the mat does not bleed on my floor and it does not get sticky or tacky. When I vacuum everything just comes right up, it is the most amazing mat ever and I have tried out a lot of products. I love how big it is, as it covers both of our doors! So now in a home not so far away from yours is a family of five with a tiny little cat that lives in the outside and on the inside of the house happily. As each day ends and is everybody treads in an out the messes no more and you have one very happy mom. The FoFlor Mat is the One Reason To Let The Back Door Open. Lavishly live life out loud, outdoors and let that back door open with no cleaning remorse!